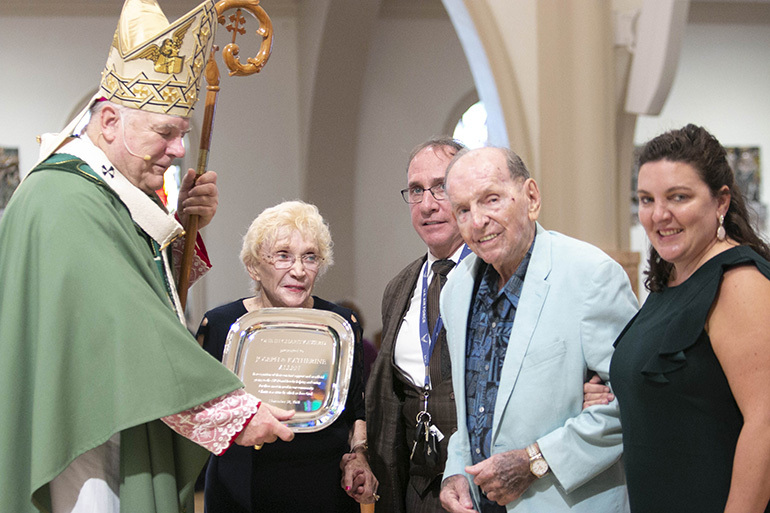 Katherine and Joseph Allen of St. John the Baptist Parish in Fort Lauderdale, accompanied by their son, Daniel, rear, and daughter Mary Delia Allen, far right, receive this year's One in Charity award from Archbishop Thomas Wenski. The award highlights their constant support to the Archbishop's Charities and Development Drive. MIAMI | The recipients of this year’s One in Faith award have a simple recipe for keeping the faith. “You have to marinate in the Lord as much as possible, rather than marinating in the world,” said Juan Bauta of St. Louis Parish in Pinecrest. He and his wife, Natalie, are the parents of six children, ages 12 to 24, whom they home-school. The couple lead four Life in the Spirit seminars every year at their parish, two for adults, one for children and one for teens. They also help organize their church’s annual 5 Nights of Fire, a week-long charismatic event that draws people from many parishes. 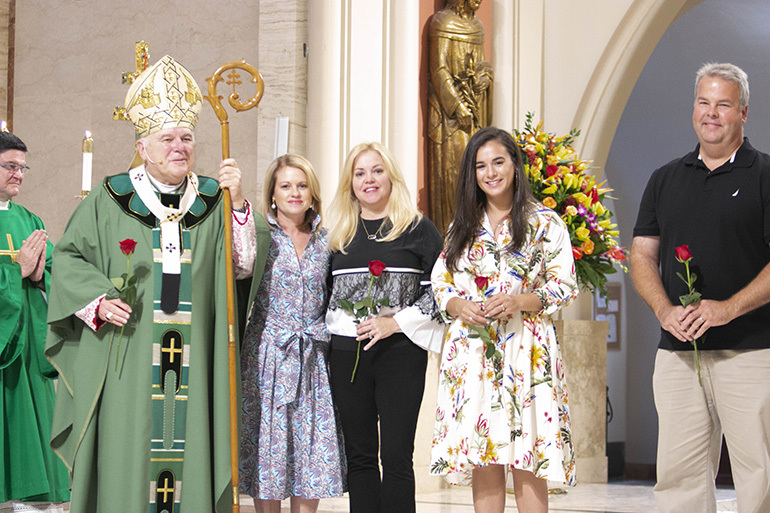 Juan and Natalie Bauta of St. Louis Parish in Pinecrest receive this year's One in Faith award from Archbishop Thomas Wenski. The award highlights their commitment to "spreading the Good News of our faith." Andres Bayon of Prince of Peace Parish in Miami receives this year's One in Hope award from Archbishop Thomas Wenski. 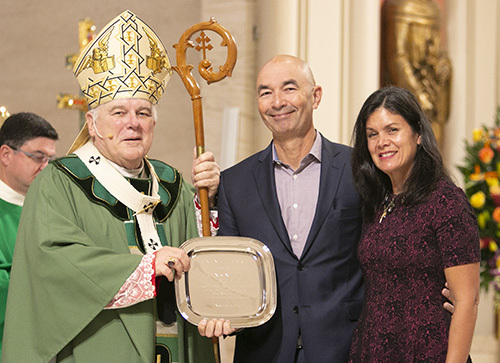 The award highlights his commitment to receiving and sharing God's gifts responsibly. The annual ThanksforGiving Mass acknowledges those who have consistently donated to the Archbishop's Charities and Development appeal, and recognizes new members of the Archbishop Coleman Carroll Legacy Society, who remembered or promised to remember the archdiocese in their will. 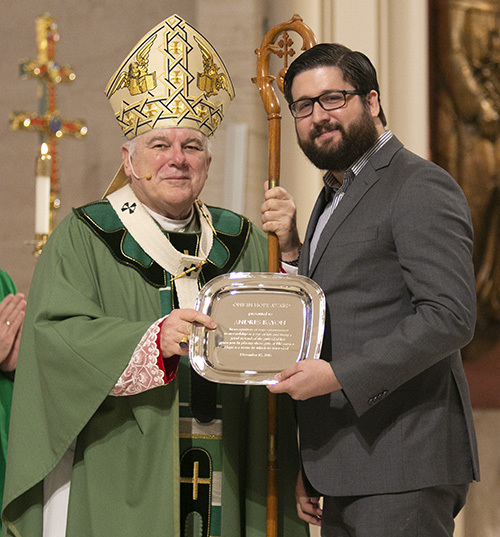 Such “excellence in evangelization” earned the Bautas this year’s One in Faith recognition, bestowed at the annual ThanksforGiving Mass celebrated Nov. 18, the Sunday before Thanksgiving, at St. Mary Cathedral. The Mass is a way of thanking everyone who donates to the annual ABCD – Archbishop’s Charities and Development – campaign, which supports the charitable and educational works of the archdiocese. One in Faith is one of three awards presented each year, each one matching the motto of the ABCD: One in Faith, One in Hope, One in Charity. Andres Bayon of Prince of Peace Parish in Miami received the One in Hope award, and Joseph and Katherine Allen of St. John the Baptist Church in Fort Lauderdale received the One in Charity award. “I was completely overwhelmed. I think I cried,” said Katherine Allen, recalling her reaction to the phone call she had received a couple of weeks earlier informing her of the honor. The Allens have been contributing to the ABCD since they arrived in South Florida from Cleveland 20 years ago. “We don’t do it for the recognition. We do it to help,” Katherine stressed. At 34, he is an unusually young recipient, and he knows it. Another way to keep the Church going is by remembering the archdiocese, or a parish, in one’s will. Those who do are inducted into the Archbishop Coleman Carroll Legacy Society. The size of the legacy doesn’t matter. Donors can direct that their life insurance policies, retirement benefits or annuities be given to the Church after their death. The archdiocese prefers that membership in the legacy society not be posthumous. Donors simply have to let the Office of Development know of their plans. Archbishop Thomas Wenski, who celebrated the Mass, thanked all the honorees and the more than 500 people who attended. New members of the Archbishop Coleman Carroll Legacy Society pose with Archbishop Thomas Wenski during the annual ThanksforGiving Mass. The roses recall the words of St. Therese of the Little Flower, who said she wanted to spend her eternity in heaven doing good works on earth.